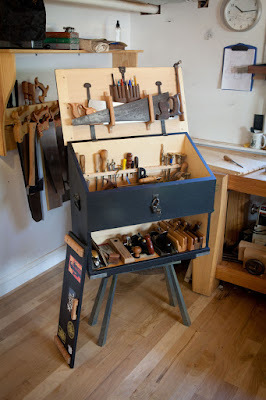 I've finished setting up the dovetail layout discussion by talking about the tools, basic set up, and design ideas. Now we're starting on the meat 'n' taters of how I go about laying out varying dovetail joints. If you are just joining in and want to catch up, you can find all the posts collected HERE. As I've mentioned before, at one point I gave up learning to cut dovetails. I swore them off like I'd just graduated from a joinery rehab program. As I understand it the real challenge isn't rehab itself, but staying away from life's temptations after rehab. I guess when it comes to being a card carrying member of JA (joiners anonymous) My temptation, provided by Master Frank Klausz, proved to be too strong for my resolve. The article he published on dovetail layout and cutting in the October 2005 issue of Popular Woodworking saved me from a life devoid of my favorite and most satisfying woodworking technique. You start the process by measuring in from each side of your stock, half of the thickness of the stock itself. This is standard 1X pine, therefore 3/4" thick, so the dividers are set to 3/8". I make the measurement on both sides. You'll see that I make a regular mistake and inevitably end up marking my measurements in the center of the board. When I do this, I then have to transfer the marks to the stock's outer face. This does illustrate that it's important to keep track of the visible face of your stock. Try to habitually work with the "outside" of the stock facing you, because when you're sawing that leaves any tear out to the inside. Then using a bevel gauge set to your chosen dovetail angle, (or, if you prefer, an actual dovetail marker) I make my first marks, making sure the wide dimension of the tails face the outside. By now you are on your way. Then adjust another set of dividers to the full width of the board. Then set the narrow width of the first pin. And use the bevel gauge to mark the opposing line. Now get out your ruler and divide the remaining expanse in half. Be as accurate as possible because these pins and tails are supposed to match in size Mis-measurement can result in a loss of symmetry and an unfavorable result. Especially over a wider expanse of stock where small incremental inaccuracies can add up to something quite noticeable by the time you're done. When the stock is wider than what I'm working here, you repeat this step, measuring to the center as many times as it takes to get the divisions correct. There's no magic number for correct, pay attention and your eyes will guide you. Make another mark with the gauge at this measurement. Make sure it is angled in the same orientation as the two lines measured from. Now take the dividers set to the FULL THICKNESS of the stock and measure the narrow width of the pin, just like you did on the first. Then mark the complementary angles. With the layout complete take a minute to inspect your work. Mark your waste and try to imagine how it will turn out. Ask yourself, "Is this acceptable?" If the answer is Yes, move forward to the sawing. It is very, very important to make sure you mark the waste on your "to be" dovetails. I know ego can sometimes sneak in after deciding you're proficient. Do not fall for that trap, it only ends in tears and frustration. The few seconds of time you take to mark your waste can make a world of difference later, especially if you have to re-prep a section of stock from scratch because of this little failing of arrogance. I do speak from experience and tears when I say things like this. Always use the pins that have been cut out to mark the tails on the joining piece. There are two reasons for this. For one, you make up for small moments of humanity by creating a mirror image that will match up into a tight joint. Also, doing this is so much quicker than trying to re-layout the joint in opposite. When I first tried dovetails, I read so many confusing things that I laid out BOTH the pins and tails on the two pieces of stock before I tried to cut them. The results were somewhat less than ideal, as you probably can imagine. A little clean up with a plane and the joint looks smooth, tight, and wonderful. The design of Frank's layout looks very strong and even, It is a great take on the joint that does not have to take center stage, in fact in a figured wood or fine design, this layout will easily slip into the back ground and not overpower. Strong, regular, and traditional, this is a good place to start our exploration. Stay tuned for more layouts soon. I wish I had this to refer to back when I tried my first dovetails. I might have had more confidence. I used to think of dovetails like eating spinach. I knew I should try them. I knew it would help make me a stronger woodworker to have this joint under my belt. I just had this fear that I couldn't get them down. However, after a lot of fretting and stalling, I held my nose and went for it. Turns out they weren't nearly as bad as I made them out to be. Now I look forward to projects where I get to try more varieties. Looking forward to seeing your completed plane shelves. Great post Derek, it is a very interesting method to layout Though I like the Alan Peters one. Keep good work up ! Fine to see the Frank Klausz lay out worked out. On video he just start cutting without using any pencil - the reason I like it. Thanks to this post I can visualize it better. As his lay out sort of defines six parts (5 full and 2 1/2), I expect that using the thickness of the stock to define the pins only gives a regular (equal paced) pattern when the board is six time wider than it is thick. How is it done with thicker and thinner stock? While this is one way to layout dovetails it is not the only way, I have several more I am going to cover here before I'm done. This is probably the most measured and time consuming method I use, but it works very well to achieve the results I described above. To be fair to the process, it appears that you have to have precalculated the thickness of the board before you walk through the process, I did not premeasure the width of this board before I started, I took a section of pine 1x10 from the local home store and ripped it in half on the table saw. Even with a board of varying widths, this technique of measuring to the center and to the center again until it looks right, leaves an even looking pattern. Julio I have to admit I can't think of Alan Peter's method right off hand, I'm gonna have to do some looking into that one. Who else have you seen demonstrate a simple, straightforward way of laying out dovetails? Who has inspired you? I'd love to hear. 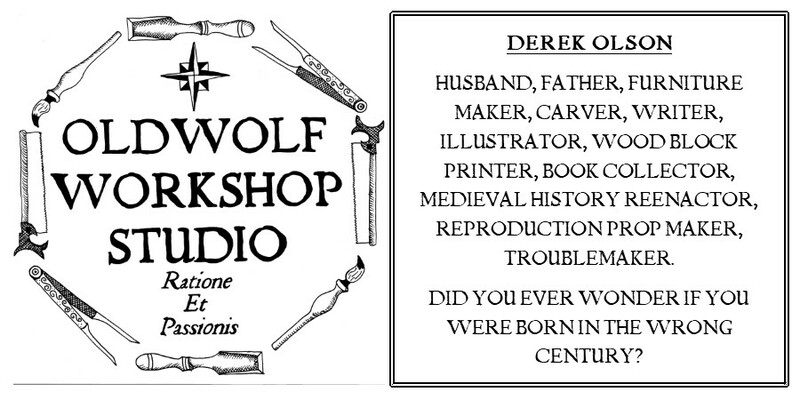 Hi Derek, thanks for answering, as you mention ther are lots of ways to layout and cut dovetails by hand. I dont want to be a 3 min dovetail guy, I like to enjoy the proccess since I try to be painstakingly. Rob Cosman learnt through Alan Peters, I thanks to David Charlesworth, he is my inspiration and my influence at my style of work. I chose this method to make dovetails because I like the way it goes but I dont want to say it is the best way or the only one. Thanks for sharing your experience Derek, it is good to know. Derek....I prefer tails first,and Cosmans method.Long ago I to was a pins first dovetailer but that changed and for more than 30 years I have laid out the tails first. Thanks for reading, absolute truth be told I also cut my tails first most of the time, This post was number three of six, and I do go further into how I lay out and cut pins first. I do think it's important to know how to be versatile and cut them either way. Rob Cosman is an incredible craftsman and teacher.